The 43rd round of the Geneva International Discussions was held on 27-28 March 2018. The illegal deprivation of life of Archil Tatunashvili, as well as creation of international security mechanisms in Georgia’s occupied regions in full respect of the Ceasefire Agreement were the main issues of the discussions. The necessity of the latter was once again vividly demonstrated by the recent developments on the ground. The Co-chairs and Participants from Georgia and the US condemned the illegal detention and deprivation of life of the Georgian internally displaced person, Archil Tatunashvili. They assessed the delay of handing over the body of deceased to the family for almost a month as an inhuman action. 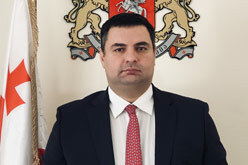 The Participants from Georgia underscored, that the torture and murder of Archil Tatunashvili is a consequence of impunity and inaction from the Russian Federation and its occupation regimes with regard to cases of deprivation of life of Giga Otkhozoria and Davit Basharuli, and thus a result of encouraging the violence against ethnic Georgians. The Participants from Georgia laid the full responsibility on the Russian Federation, as the power exercising effective control over the occupied regions. They called on the Russian Federation not to impede the investigation process, in order to bring perpetrators to justice. The Georgian participants also underlined the necessity of the immediate detention of the murderer of Giga Otkhozoria. Against this background, the Participants from Georgia stressed the urgent need for establishment of international security mechanisms in Georgia’s occupied regions and the withdrawal of Russian military forces, as envisaged by the EU-mediated 12 August 2008 Ceasefire Agreement between Georgia and Russia. Intensive discussions took place on the draft statement of the Participants of the Geneva International Discussions on the non-use of force. The Georgian Participants once again highlighted that the adoption of the statement should serve the concrete purpose, namely, the start of implementation process of the 12 August 2008 Ceasefire Agreement. The Participants from Georgia and the US emphasized the necessity that Russia affirms and implements the non-use of force commitment. The Russian Federation demonstrated destructive approach and by making deliberate provocative statements deadlocked the negotiations on the topic of non-use of force. Throughout the negotiations, grave security, humanitarian and human rights situation in the occupied territories of Georgia was extensively discussed. The Participants from Georgia raised the facts of violation of the 12 August 2008 Ceasefire Agreement by the Russian Federation. The ongoing military build-up and illegal military exercises in Georgia’s occupied regions were assessed as an attempt to destabilize the situation on the ground. The Georgian participants expressed concern over steps taken by the Russian Federation towards factual annexation of Abkhazia and Tskhinvali regions. Discussions also focused on installation of razor and barbed wire fences and other artificial barriers along the occupation line, closure of the so-called crossing points, restriction of the freedom of movement and other discriminatory measures, having grave impact for the local population. It was noted that the practice of illegal detentions and kidnappings, as well as the restriction of access for local population to their agricultural land plots, provokes the tensions on the ground. Special attention was paid to the increased ethnic discrimination of Georgians in the occupied regions, particularly in Gali and Akhalgori districts. The Participants from Georgia raised the issues of forced registration of local Georgian population as foreigners and further restrictions of their fundamental rights and freedoms that represent the continuation of ethnic cleansing. They underlined the facts of destruction of private property of the ethnic Georgian IDPs and refugees in the occupied regions of Georgia. The necessity of ensuring the possibility of getting education in native language in Gali and Akhalgori districts was also discussed. The Co-chairs, as well as the participants from Georgia and the US, stressed the necessity of substantial discussions on safe and dignified return of IDPs and refugees, which is one of the key issues in the Agenda of the Geneva International Discussions. The Russian Federation and its occupation regimes still tried to politicize the humanitarian issues and walked out of the negotiations during the discussions on this topic. Next round of Geneva International Discussions will be held in June, 2018. Geneva International Discussions were launched on the basis of the 12 August 2008 Ceasefire Agreement. Discussions are held within the frames of two Working Groups, where participants are represented in their individual capacity. In the first Working Group talks are focused on security and stability in the occupied territories of Georgia, while in second Working Group – on humanitarian and human rights situation in Abkhazia and Tskhinvali regions, as well as on the issues related to safe and dignified return of IDPs and refugees to the places of their origin. The discussions are held with Co-Chairmanship of the EU, UN and OSCE, and participation of Georgia, the Russian Federation and the USA. The Head of the Provisional Administration of the former South Ossetian Autonomous District and the Chairman of the Government of the Autonomous Republic of Abkhazia, as well as the representatives of the Sokhumi and Tskhinvali occupation regimes also attend the Working Groups.